Recently there has been quite a bit of discussion in dentistry about cavity prevention/arrest with silver diamine fluoride. The chemical shows a lot of promise in helping to arrest decay. In fact, the promise is great enough that the American Academy of Pediatric Dentistry released a position paper on its use. The most notable drawback of the chemical is that it stains things black. That means that on an open carious lesion, the decay process may be arrested, but the lesion will appear black which could potentially fool the untrained eye or those “just taking a glance”. The chemical will also stain clothes, countertops, etc. Because of this, many practitioners have been hesitant to use it. However, Riva Star from Southern Dental Industries (SDI) claims to offer all of the benefits without the staining. 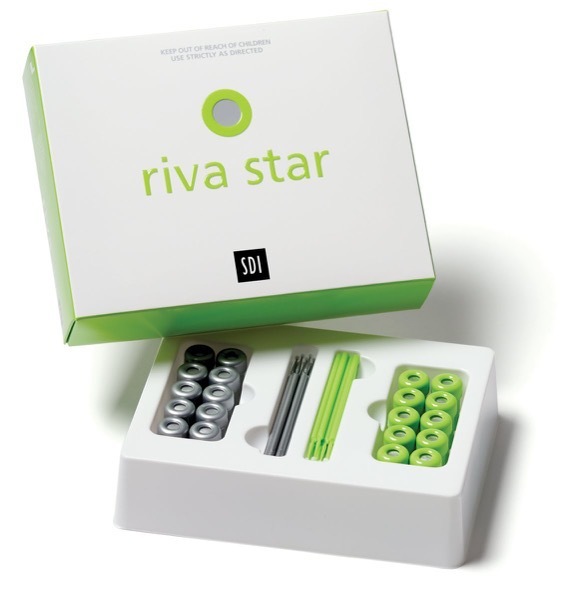 Riva Star was designed by three renowned Australian clinicians, bringing together their clinical knowledge and experience of using these three exceptional components, and combining them into one STAR product – Riva Star! Unlike other silver fluoride systems, Riva Star’s two step patented procedure minimises the risk of staining. By applying the potassium iodide solution over the silver fluoride, a silver iodide creamy white precipitate is formed and washed off. Riva Star is an effective biofilm inhibitor. This is supported by study results from Otago University (NZ), that Riva Star has a higher inhibition zone against four bacterial species compared to sodium hypochlorite. We’ll be evaluating Riva Star and reporting back here in after we’ve accomplished a few clinical cases. Stay tuned.